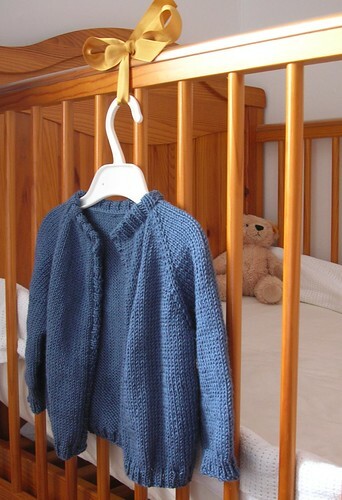 Back in the spring, when P was still fairly little, and the weather was gradually getting warmer, but not that warm yet, I started a basic blue top-down raglan cardigan in baby bamboo, intending to have it finished in a couple of weeks so that P would have something to wear over a t-shirt. The knitting part of it was fairly straightforward and I made reasonable progress, until that is I hit the button bands. Try as I might they came out looking wibbly, curly, and insubstantial and I decided I didn't like them at all. So, after some degree of fiddling, I finally hit on the idea of copying the neckband from the Tangled Yoke cardigan, by knitting them double width and then folding them over with a three-needle bind-off. I could then sew on a zip and have neat, zip-fastened cardigan. I even got as far as buying the zip, and all that remained was to block it and do the sewing. However, things in our house being what they are these days, blocking is not as easy as it once was. For a start there's the problem of finding enough free and uninterrupted time to wash and pin out a garment. Secondly there's the small matter of finding somewhere to put it to dry where small hands (or feet) can't get at the pins. So, as usual it remained in the cupboard and every week I promised myself 'I really will find time to block it this weekend'. Last weekend I got it out and looked at it and realised that it's never going to fit P now, or at least (even if it stretches when blocked) not for more than a couple of weeks. However, all is not lost, since somewhat to our surprise, it appears that the cardigan may have another taker before too long (some time around the end of January in fact - though presumably it will be a little while before it actually fits him/her*). I guess I better get round to blocking it before then, though, since it seems doubly unlikely I'll have chance afterwards! *At least I damn well hope so given it was meant to fit a 10-12 month-old! oooh - CONGRATULATIONS! That's fantastic news! We must see each other soon.